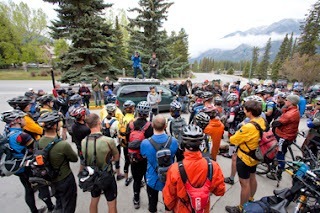 About 60 cyclists from all over the world left from Banff, Alberta, June 8 for the start of the 2012 Tour Divide Race. This grueling, off-road adventure has been dubbed “the world’s toughest mountain-bike race” and for good reasons — the epic Great Divide Mountain Bike Route (GDMBR) traverses over 2700 miles, climbing a total of over 200,000 cumulative feet as it crisscrosses the Continental Divide from Banff to the US/Mexico border at Antelope Wells, New Mexico. I met these riders when I was completing the last half of my first TransAm while I was in Colorado, they were a decidely tough group, even for long distance riders. Remember touring etiquette, buy them a beer or a meal if you meet them. The reward is often a story of the last few days, and believe me when I say, that is all you want to hear.